If you’ve been hesitant to officially become a cord cutter due to the lack of full local channels, a solution has finally arrived in the form of the AirTV Player – Sling TV’s version of a TV tuner box. Today, we’ll be going over everything you need to know about this device, and whether or not it’s the right fit for you. What Is The AirTV Player? As briefly mentioned above, it’s essentially Sling TV’s attempt at bringing a TV Tuner box to the cord cutting world. Sling TV is hoping to compete with the popular streaming devices likes the Roku Ultra, Amazon Fire TV products, and Apple TV by offering voice search functionality, a more intuitive remote, and local channels via an OTA digital antenna adapter. The AirTV Player allows you to access services like Netflix, Sling TV, and even many local channels all via one simple interface. We love Sling’s solution for integrating OTA channels alongside Streaming TV services! 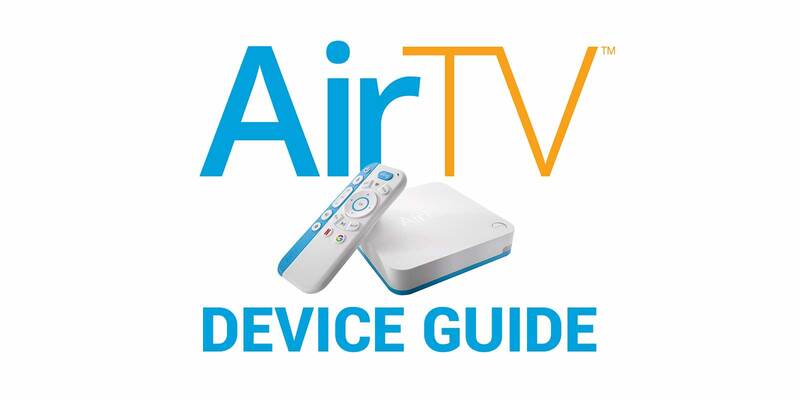 There are two separate AirTV products available—The device itself (Which includes the Player box, and a remote) and the AirTV Adapter. Aside from monthly fees you pay for your TV services, such as Netflix or Sling TV, there is no cost to use the AirTV Player. 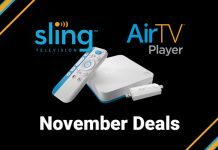 The AirTV Player costs $99.99 by itself, and will allow you to access Sling TV, Netflix, and Google Play for all your TV watching needs. However, it does not include local channels. You’ll need an the AirTV Adapter for an additional $39.99 and a digital antenna of your choice to unlock access to free local channels such as ABC, CBS, NBC, FOX and more. You can purchase an OTA antenna from most major electronics retailers, such as Best Buy or through digital stores like amazon.com. Typically, a digital antennas will cost between $25-$30, and require very little effort to set up. The setup instructions are located right here, but all considered it’s a very simple process. All you have to do is plug the device into your HDTV via any HDMI cable. Once you’ve got your antenna setup, you simply connect it to the Player box via the AirTV Adapter. An on-screen prompt should appear, which will guide you through the process of scanning for and integrating local channels with your AirTV Player. To access these channels once they’ve been integrated, you simply go to the Guide in the Sling TV app. It’s also worth noting that you do not need internet access to view local channels – all you need is a satellite and the adapter! What Local Channels Will I Get? The answer is “It depends”. As local channels are – well, local – what may be available in one area will not necessarily be available in another. AirTV.net recommends visiting AntennaWeb to find out what channels you’ll be able to access using the AirTV Adapter. Do I Need a Sling TV Subscription to use the AirTV? Longer answer – While you won’t be able to access your local channels directly from the Sling TV app’s Guide without a dedicated Sling TV subscription, you can simply hop over to Google Play and grab Google’s own Live Channels app, which will allow you to browse any over-the-air TV you have access to with the AirTV Adapter. In other words, the AirTV Player becomes just another Android TV streaming device without a Sling TV subscription. What makes the AirTV Player different than other streaming devices? Aside from offering OTA local channels (Something no other major streaming device has done yet), the AirTV Player offers 4K video capabilities, voice search, a huge array of Google Play apps for you to access, and a much simpler remote. Remember that you’ll need a 4K tv to take full advantage of the 4K content the AirTV Player offers. Can I Pause Broadcasts Within Sling TV? Unfortunately, no. The AirTV Player’s version of Sling TV does not allow you to pause or rewind live TV, nor does it offer any DVR functionality (Whereas other Android TV devices already allow DVR via a public beta). This functionality may be added in the future, but Sling has yet to offer any concrete estimates for when that might be. This largely depends on your specific network provider (some are more reliable than others), but there are a few basic requirements – for optimal streaming quality, you will need at least a 3Mbps download speed for Standard Definition video. However, HD quality viewing will require at least a 5Mbps download speed. The AirTV Player boots up into Sling TV by default. You can access the Android home screen by pressing the bottom-left button on the remote. Here you can access just about any apps you’d normally be able to access from an Android TV device – YouTube, Google Play movies & TV, etc. And, of course, you can access Netflix and Google Play quickly directly from the AirTV Player’s remote by pressing their dedicated buttons. While it may not be the perfect solution for everyone, Sling’s AirTV offers cord-cutters a unique solution for “streaming TV’s” general lack of local television broadcasts. We look forward to seeing what’s next for Sling’s unique white and blue box. Look for our hands on demo with the Air TV coming soon! 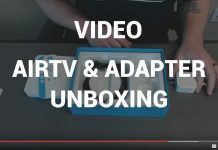 Does the AirTV Player/Adapter allow you to stream OTA channels to all devices in your home, or is it only on the tv where the player is connected? 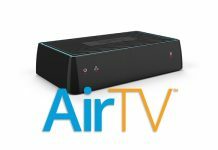 I know the AirTV 2 came out to allow whole-home streaming, but I haven’t found anything about whether the ‘Player’ does. Zach, sorry for the delay in response. The AirTV player only allows for OTA on the TV where the device is connected. As you mentioned, the new AirTV player (AirTV2) should allow for streaming live OTA TV anywhere.